Under Keyboard Shortcuts : Application Shortcuts I've already tried with either "Search With Google" or "Google Search..." as the Menu Item (both of these for Application set as Google Chrome, of course). 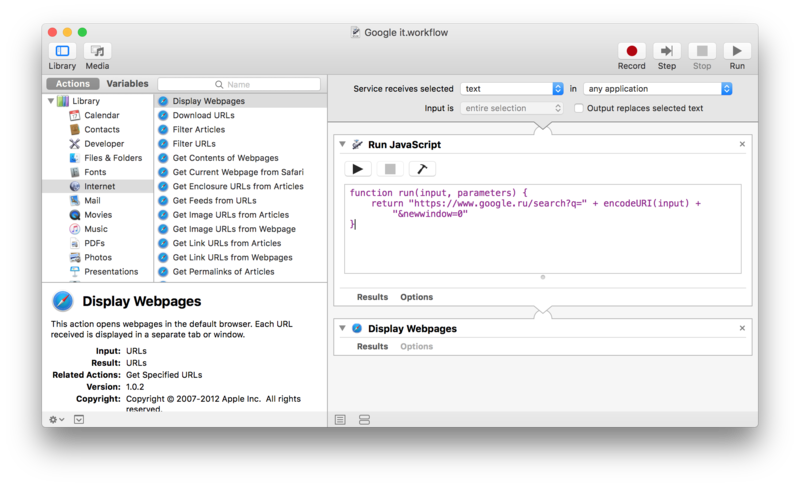 Also, even with Chrome as the default browser, the Search With Google (under Services : Searching; which works) always uses Safari. In short, how do you set up a keyboard shortcut to avoid right-clicking the selected word and choosing Search Google for 'the selected word' from the right-click menu? The Search With Google service is provided by Safari, and it is not meant to work with other browsers. 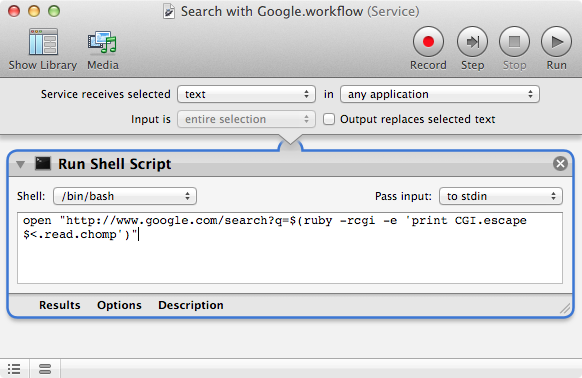 Add a Run Shell Script action for a script like open "http://www.google.com/search?q=$(ruby -rcgi -e 'print CGI.escape $<.read.chomp')"
Just wanted to add that if you use accepted answer and save the service as "Search with Google", it will be executed instead of the service of the same name that launches Safari. Not the answer you're looking for? Browse other questions tagged google-chrome keyboard-shortcuts osx-lion or ask your own question. How to customize Google Chrome keyboard shortcuts? Is it possible to create a keyboard shortcut for an application menu item in Windows?